My newest version of てまり桜 by 布施知子 (see this post for more info). I hope this calms the visitors down ;) I’m back on track with this red kusudama! 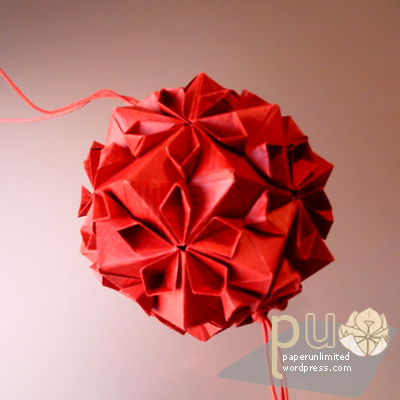 It isn’t quite totally to my liking yet but it’s quickly approaching :) This cute kusudama was made with 7x7cm/ 2.8″ red kraft paper and has a diameter of 8cm/ 3.1″; as I expected it’s so much cuter in red! The next one will be with some floral pattern… Or perhaps with a simple traditional pattern… What do you think will be the best? This entry was posted on 2007|11|13 at 14:55 and is filed under kusudama, modular origami. You can follow any responses to this entry through the RSS 2.0 feed. You can leave a response, or trackback from your own site. Hello! I loved this cherry blossom ball, it’s really cute! can you send me the diagram?! Hy! 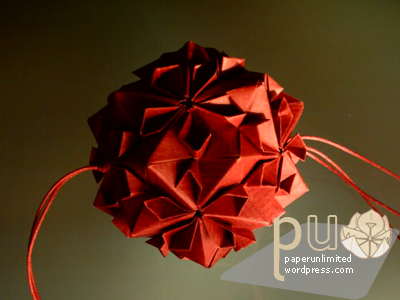 I’m desperately looking for diagrams for these kusudama because it’s gorgeous. My friend is having her wedding and I’d like to make her a few of these (in red and white) ;). I’m new to modular folding and making kusudamas but take inspiration from your work which is meticulous and exquisitely done. The Cherry Blossom Ball is just one of many examples that I’d like to try but find that the Origami Tanteidan Magazine issue/volume is out-of-print and unavailable. Could you recommend which of Tomoko Fuse’s book might help me get a basic start for trying to figure out the diagram? Or if you know of another source, I’d greatly appreciate your time and help. Hi! I came across your image of this cherry blossom sonobe and just loved the elegance and simplicity of it. I’ve tried looking for diagrams unsuccessfully, and have not been able to get a hold of Tanteidan #72 either. I would really like to make this as a gift for a friend, is there a way I can get the diagrams from you or if you can point me to where I can get it? Your work looks crisp and beautiful. The red is a nice colour choice. Would it be at all possible to get the diagrams off you so that I could have a go at making this (as a gift)? I know everybody asks you for this diagram, but maybe you actually do send it to those who ask? I am getting married on saturday and we have a lot of references to Japan (we met there on a blind date from Europe/US two years ago. I have been looking to get a hold of this diagram for weeks because I would love the symbolism of our wedding guests, who will have origami at the tables, leaving us with a hundred blossoms that we can turn into a new shape. Please, would you contribute by sending me the diagram? Hello, I am a big Origamifan. I search this model but I can’t found it. Can you help me? Can you send me the diagram or a link where I can download it. this is cherry blossom ball is so pretty! is there any way that i get a copy of the diagram for this? I am a fun of your work, all of them are very beautifull. Please do send me the diagram if you can or let me know where to get it from. Is it from one of Tomoko Fuse’s books? It’s beautiful. Can yo send me this diagram, please? Because I can’t find this. folds are really precise and flawless.would be glad if you can share the foldding techniques. Omgg, the red one is really pretty!! As well as all the other people, I’ve looked for this diagram for a LONG time on the internet, but have yet to find it. Is it possible that you can send me the diagram, if not then where to purchase the book that the diagram is in? Again, I’m not sure if you are able to share the diagram/folding techniques…but if you do, or have a reference you can offer…may I have a copy? Sorry…..wrong email the first time…. This comment has the correct one. hola! yo ya la hise la cherry blossom ball pero no se como hacerle los petalos de colores que se le meten me podrias ayudar con eso?? bueno gracias ! If you go to youtube.com you can actually watch video instructions. @megan: thank you for sharing the video. hi, I’ve been looking for ages to get any pattern of kusudama and I really want to make one. Can you please email me any diagrams you have of kusudama. It would be very much appreciated. I have been trying to find a good quality source for this idea and good thing I visited your internet site.